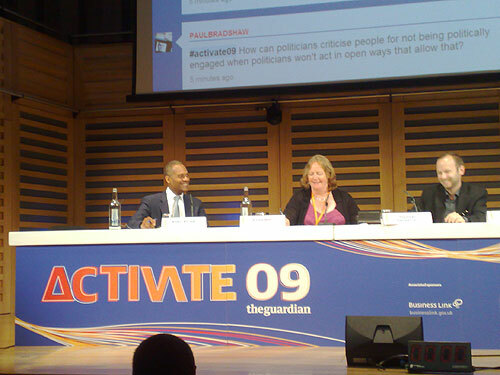 Wednesday was The Guardian's first Activate summit - a one day conference at Kings Place bring together people to discuss how technology, politics and social sciences could come together to forge the future. Yesterday I published some thoughts about the presentations by Gerry Jackson and Nick Bostrom. One panel, chaired by Emily Bell, focused specifically on politics, featuring former minister Tom Watson, shadow minister for science and innovation Adam Afriyie, and Thomas Gensener from Blue State Digital. Adam Afriyie's presentation style was a marked contrast to what had gone before - it felt like suddenly being at a scripted press conference rather than a tech & media conference. In truth, I was a bit concerned that the Twitterfall going on behind him was going to kick into life with lots of criticism of his delivery. However, he turned out to be pretty 'on message' for the crowd, backing the release of more Government and Local Government data in open formats. This was significant, as I guess most British people in the room expect that at some point in the next 12 months Afriyie will get to drop the 'shadow' bit of his job title. I think one of the most telling points about the upcoming British election was made by Gensemer though. When asked if we would see a similar level of online activism in the UK to that shown in the US for the Obama election campaign, he doubted it. Although there would be more than before, he didn't think that the Labour Party in particular had done the groundwork in the previous two years necessary to build up their online activist base. He stressed that the Democrats had been at rock bottom after John Kerry's defeat - "we lost worse in 2004 than we had 'won' in 2000" he said - and so had re-built their campaigning base from the ground up. I couldn't help thinking that the fixed timetable of American election must help campaign planning, on the technical side at the very least. Tom Watson did think numbers could be mobilised quickly - citing the anti-BNP campaign involving Searchlight run for the recent European Election. In the space of six weeks they had recruited nearly half the number of members that the national Labour Party has. However, I suspect that 'stopping the BNP' is a rather more appealing cross-political-spectrum rallying cry than "Save Gordon Brown". As is often the case in these debates, going back to your first principle questions is instructive. Gensemer pointed out that you can use all of the technological tools in the world, but if you have 100 of your supporters in a room, and you don't know exactly what you would ask them to do to help that very day, then you are not campaigning effectively, online or offline. During his talk Tom Watson cracked a few jokes, but you still got the sense that he had left Government feeling frustrated at what hadn't been achieved rather than jubilant about what had been. He left me with the wonderful 'Yes, Minister' image of civil servants enthusiastically championing open Government and technological innovation, but gently suggesting that maybe it would be better if another department tried it out first. There were some dissenting voices amongst those clamouring for data to be released. In a later session it was pointed out from the audience that the desire to see this data seems to come from a mainstream media attempt to find negative facts in there, rather than from a positive desire to use the data to improve services. There was also a feeling that the scrutiny that had been applied to MPs Expenses rather missed out explaining to the public that this was an absolute drop in the ocean compared to the overall public spending budget. It was pleasing to hear Afriyie call for a 'TheyWorkForYou.com' for local government, given the frosty reception the site initially received in most of Westminster and Whitehall. My own personal reservation is that one vested interest in keeping data secret at a local level is because it will transpire that the quality of the data held by our local councils on their own services will turn out to be pretty poor. Another related point during the day - and I apologise, I forget who made it, maybe Will Perrin? - was that it used to be only a select band of people who knew how difficult it was to find things out. Researchers and journalists knew that getting accurate information was like pulling teeth, but the rest of us got newspapers that were full of information, so didn't see the struggle to produce it. Now, thanks to Google, we can all use the Internet to try to find out what time our local post office or council swimming pool is open, wrestle with poorly designed websites and badly formatted data, and perceive a gap between how easy it is to find information and how easy it should be. 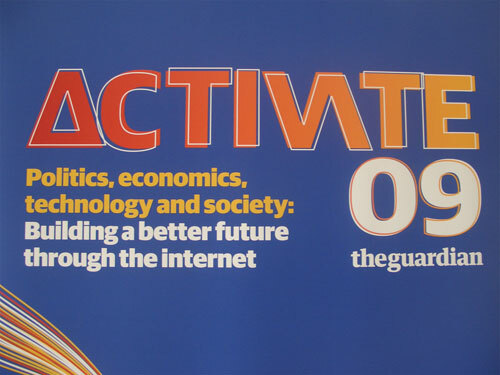 Roo Reynolds has produced such a fantastically comprehensive set of notes from the Activate 09 conference that I feel genuinely relieved that I don't have to. I do hope to return to the theme next week though, with a couple more blog posts about my reflections from the day. By Martin Belam on 3 July 2009.